Most owners of the city's dangerous soft-story apartment buildings have failed to notify their tenants about the potential for structural collapse. 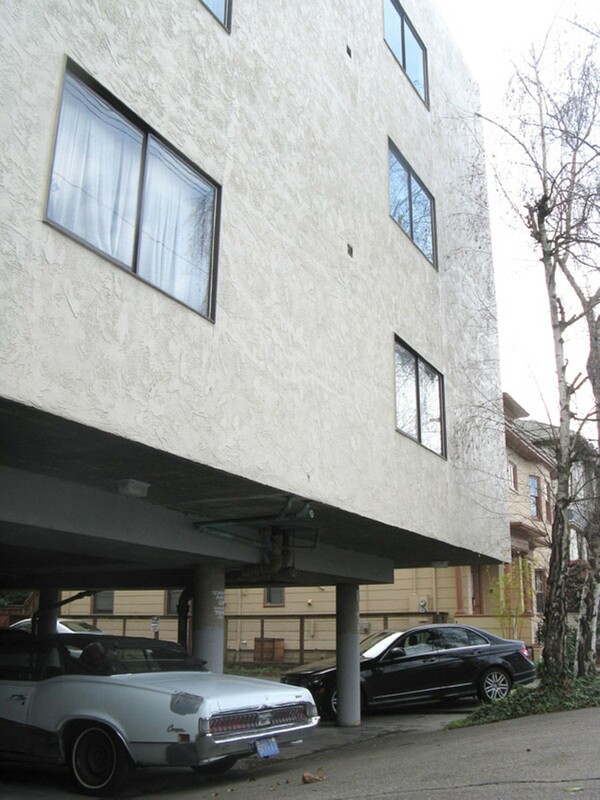 A vital effort to retrofit some of the most seismically unsafe buildings in Berkeley has been stalled for several years, putting the residents of thousands of units at greater risk of having their buildings collapse in a major earthquake. This week, as Haiti continues to cope with its devastating earthquake crisis, the Berkeley City Council will attempt to get its program moving again. Fourteen years ago, Berkeley identified 320 buildings that were particularly vulnerable to collapse in a major quake because they have gaps and openings on their ground floors — usually parking spaces or storefronts — known in building-code jargon as a "soft story." Then in 2005, the city adopted a soft-story ordinance designed to encourage the owners of unsafe buildings to begin retrofitting. But the 2005 effort was the first step in a two-step process to protect residents, and it didn't include a retrofit requirement. It did, however, require building owners to post signs and deliver notice to all tenants that the building is a soft story and vulnerable to collapse in an earthquake. But even this first step has proven to be complicated, and, more than four years later, it's only partially complete. Berkeley Councilmember Laurie Capitelli said that many building owners are either ignorant of the ordinance's requirements or have decided to defy them. These owners have not posted signs or made an effort to prove they shouldn't be on the soft-story list, let alone begun retrofits. "We want to push those people to move forward," said Capitelli, who coauthored an item that comes before council this week to give soft-story-building owners one last warning before penalties are imposed later this year. "They need a letter that's got a little bit of a stick to it. It's time for the carrots to be over." Berkeley's slow progress on its soft-story ordinance has not been a total failure. According to the Planning Department, about 10 percent of the buildings identified in 2005 as unsafe have completed their retrofits, with another 10 percent in the process of retrofitting. But that still leaves more than 200 that remain unsafe. The city, meanwhile, cut a staff position for the soft-story program last summer, leaving behind just part-time hours for a Planning Department staffer to monitor and enforce whether a building belongs on the soft-story list or not (a complex process in its own right). According to Planning Department chief Dan Marks, the work of checking up on which buildings have posted signs as required by the ordinance may be spread to other city departments, such as housing, fire, or the Rent Stabilization Board. "This will delay, possibly permanently, the enforcement phase of the soft-story ordinance," said Jesse Townley, an elected member of Berkeley's Rent Stabilization Board and a commissioner on the Disaster and Fire Safety Commission. Townley addressed his concerns in a heated letter last fall to Berkeley Mayor Tom Bates, as well as councilmembers Capitelli and Jesse Arreguin. Townley posed a rhetorical question in his letter, pondering whether Berkeley city staff would "explain to the next of kin why their loved ones were crushed to death? That some piddly amount of money delayed this program for a couple more years, and the dead were the unlucky, unknowing gamblers whose chips were cashed in?" Arreguin, who coauthored this week's council item, says that the Planning Department is committed to having seismically safe housing in the city. It just has limited resources. Arreguin worked on the soft-story issue prior to being elected to city council when he sat on the Rent Stabilization Board. "With any policy, with any program, once you implement it you realize that it's more complex than it actually seemed to be," he said. "Despite the fact that the ordinance requires that notification happen, the city has not been holding owners responsible for not notifying tenants," he said. He noted that supporters of phase one of the soft-story effort had planned to begin the more important phase two retrofits no later than 2007. "This is a life-or-death issue," he said. "We need to be doing everything we can to try to move this issue forward." Progress has been further delayed over the issue of who will end up paying the costs of the retrofits. Arreguin hopes to find some funding to keep tenants from having to foot the bill when their buildings are fixed. "We do not want hundreds of tenants throughout Berkeley to have huge rent increases all of a sudden and to have them forced out of their housing," he said. Capitelli agrees that any future discussion on the phase-two retrofits will be complicated by the question of who will pay for them, especially with bank loans so hard to obtain in the current economy. "It's easy to say to a soft-story owner: 'Fix your building,'" Capitelli said. "It's a little harder for him or her to address the issue and finance it."